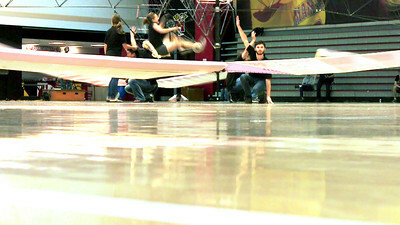 Still shot from video of flight. View the hi-res version. COLLEGE PARK, MD.—The National Aeronautic Association has certified that on May 12, 2011, the human-powered helicopter Gamera, designed and built by graduate and undergraduate students of the University of Maryland's A. James Clark School of Engineering and piloted by biology student Judy Wexler, achieved lift-off and hovered for 4.2 seconds, thereby establishing the U.S. national records for the duration of a human-powered helicopter flight and the duration of a human-powered helicopter flight by a female pilot. The NAA has submitted information to the Fédération Aéronautique Internationale to permit evaluation of the flight for world records in the same categories. The NAA states that this process may take two to three months. "Capturing two U.S. national records is a magnificent accomplishment for our student team, and a significant first step toward winning the Sikorsky Prize," stated Clark School Dean Darryll Pines. "In fact, the team has now developed a plan for a prize attempt in the fall of 2011. First, based on the May 12 flight, we believe that Gamera may already be sufficiently stable so as to achieve the prize requirement of remaining within a 10 square meter area during flight. Second, in the next several weeks we will make improvements to Gamera's transmission and weight, and attempt a second flight to achieve the required 60-second hover. Finally, in the fall, we will put it all together—a flight that lasts at least 60 seconds, achieves a 3-meter height at some point, and remains within the required area." 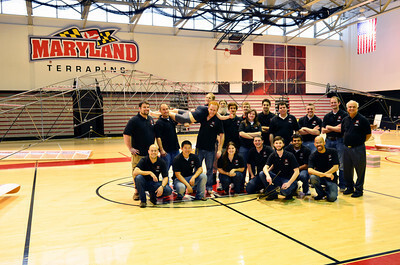 One of the Gamera team leaders, graduate student Brandon Bush, noted that the team wished to acknowledge the debt they owe to two previous teams, one from the California Polytechnic Institute and one from Nihon University in Tokyo. The Cal Poly team, according to the NAA, set a "special category" record in a different flight classification. "We learned a lot from our predecessors," Bush stated. "We are all trying to accomplish a difficult challenge, and to expand the world’s notion of human flight capabilities. If we succeed in our efforts to capture the Sikorsky Prize, it will be in part based on the efforts of these earlier teams." Download the h-res WMV file of the final flight video. The Sikorsky Prize was established by the American Helicopter Society, International, to inspire teams and individuals to advance knowledge of helicopter flight and to honor helicopter pioneer Igor Sikorsky. The prize has never been awarded to date. For more information about the Sikorsky Prize, see http://www.agrc.umd.edu/gamera/sikorsky-prize.html.